Companies like IBM, Intel, Compaq, DELL, Corel, Motorola, Oracle, Borland Inprise, SCO, Creative, SGI, nVidia, 3DFX, and others, in one way or another are supporting Linux providing software, creating it, offering solutions, concentrating all their efforts and giving technical support on Linux, creating a real interest and helping it's advancement. There are also companies that have been in the Linux community since the beginning like RedHat, VA Linux, Linuxcare, Penguin Computing, Caldera, S.u.S.E., Mandrakesoft. CiberLinux Networking pretends to be your entry point to Linux. Be it that you're just getting to know Linux, or you're thinking on installing a server, a LAN, or maybe you're a company that needs help with Linux, we have the technical knowledge and the experience of many years working with Linux and can help you acomplish what you want to achieve. WHAT CAN BE DONE WITH LINUX? Perhaps a better question to ask would be: What can't I do with Linux? Because Linux has the special characteristic of being very versatile, wich can adapt to almost any task be it very specific or general. Of course, it's not the solution to every problem, but because it's an open operating system, it can acomplish countless tasks. If you work in an office, or have some computers that you want to connect to share information and resources, you can do it with Linux. We can name some advantages like the capability to connect diferent types of platforms. 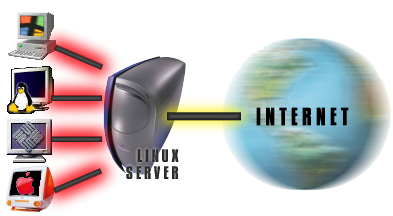 Linux can interoperate with computers that have Windows 95, Windows 98, Windows NT, Apple, Netware, and different flavors of UNIX. It's possible to share printers, iformation, programs and resources. It can be used to build an Intranet, with mail services, and web services. 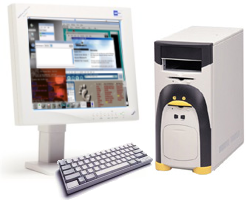 As an Internet Server, Linux is famous, in fact, it's one of the areas where Linux is more used. If what you need is to provide e-mail services, web hosting, create a Firewall, a Proxy Server, FTP services, CGI's, PHP, and many more services, Linux can offer them in a fast, robust and stable way. It can also offer services like e-commerce so you can have secure transactions with your clients. Today Linux is being used also as a Workstation because of it's multitasking capability and it's level of stability wich lets you execute several tasks at the same time. With Linux as a Workstation, you have the capability of customizing your enviroment in every level to use all the resources in a more efficient manner. If there's an aspect of Linux that is more critisized, it's the ease of use for non-technical users, who use their computer to do relatively simple jobs like word procesing, websurfing, or videogames wich don't require to have a lot of knowledge about the inner workings of the computer or operating system thei're using. All this has drastically changed. Some companies have focused in making the installation of Linux a very easy task, also it's configuration and maintenance, as well as create documentation and building of applications for office use, videogames, and the biggest collection of Internet sofware you can imagine. As a developers platform, Linux is one of the best options, because you're capable of using a wide range of programming languajes like C, C++, Java, Perl, Python, PHP, Fortran, Ada, Cobol, TCL, and many more. Being an open system, all of Linux source code is available, with the possibility of modifying any part that we want when ever we want. And not only on Linux, but on hundreds of other open source applications thanks to the incredible ammount of tools that help you in the creative process of programming.